It is one of the world's strangest and smallest sea creatures, growing to no bigger than the size of a lentil. But the tiny pteropod, with its translucent shell, could help scientists understand how marine animals will respond to the stresses of climate change. Thousands of the molluscs, also known as sea butterflies because of their wing-like lobes, have been collected from the shallows of Antarctica. After flying the samples thousands of kilometres to her laboratory at the University of California, Santa Barbara, marine biologist Dr Gretchen Hofmann plans to sequence the animal's genome. She hopes to find genes and molecular pathways that might predict how shelled creatures will respond to warmer, more acidic oceans. "They're a shelled organism, they make a shell just like a mussel or an oyster does," she explains. "It's a tiny, very fragile shell and we know that their ability to survive and form this shell is very threatened by climate change conditions in the ocean, a situation that's called ocean acidification." Some of the carbon dioxide released from fossil fuels ends up in the oceans, where it combines with water to form carbonic acid. As the ocean absorbs the excess carbon dioxide, its alkalinity drops. Research suggests that as seawater becomes more acidic, the calcium carbonate shells of pteropods become thinner and may eventually disappear. Since the shell helps protect the creature from predators, it is unclear whether it will be able to survive. "Currently, ocean pH is about 8.1, and some of the emission scenarios suggest that ocean pHs could go down to 7.8, which is very drastic if you're a little pteropod living out on the ocean," says Dr Hofmann. She says the changed pH of the ocean threatens the marine snail's ability to pull building blocks for their shells out of the seawater. "It's not the kind of a condition that animals can escape from; they can't migrate to get away from a global ocean that has a different pH, so it's a dire situation," she says. "For the pteropods, we know from the work being done by climate change biologists that polar seas, the Arctic and the Antarctic, will experience very acidic oceans first, so there are some models and some estimates that say by the year 2050 it may be that conditions are such that pteropods will no longer be able to make shells in the Southern Ocean." Given their role in marine communities as fodder for the likes of penguins, salmon and whales, the threat to pteropods could have far-reaching effects. "They're incredibly important sources of food for fish," says Dr Hofmann. "At times, I've heard fishery biologists calling them the potato chips of the oceans." 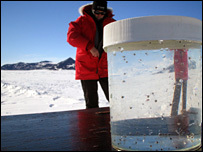 Dr Hofmann's laboratory is using sea urchins as a model for studying how shelled organisms might adapt to climate change. 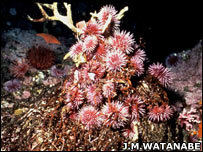 Like the pteropod, the sea urchin has a calcium carbonate shell. Unlike the pteropod, however, its genome has already been mapped, giving scientists a variety of molecular tools to study how genes are switched on and off during the shell-making process. In the laboratory, scientists recreate a future atmosphere that has all the components of today's air, but three times higher CO2. "We're using the IPCC emission scenarios for C02 as a framework to test these outcomes," says Dr Hofmann. Their research has shown that sea urchins can make a skeleton at very high C02 levels by "turning up the volume" of certain genes by three to four times. But this has an energetic cost to the animal, and they become more sensitive to temperature. Dr Hofmann and Victoria Fabry of the California State University, San Marcos, aim to carry out similar studies on pteropods. They plan to extract DNA from the organism and use a new high-throughput sequencing method to study its genetic make-up. The DNA is a "roadmap" for looking at the code for all the enzymes and other proteins that the body makes, Dr Hofmann says. "If we know the DNA sequence, we have the 'secret decoder ring' to ask what genes are going off and on in this animal as it responds to the conditions around it in the ocean," she explains. The scientists are interested in two categories of genes in calcifying animals - those involved in making the calcium carbonate shell itself and a suite of genes that respond to high temperature stress. These "special defence genes" protect the cell from damage when temperatures rise, and are present even in mammals, functioning to rescue the body during a fever, for example. "One of the things we know about climate change is that it's a double jeopardy situation," adds Dr Hofmann. "We have warming and acidifying seas that will impact these animals. Our experiments are trying to help us predict what future oceans will mean for current organisms."